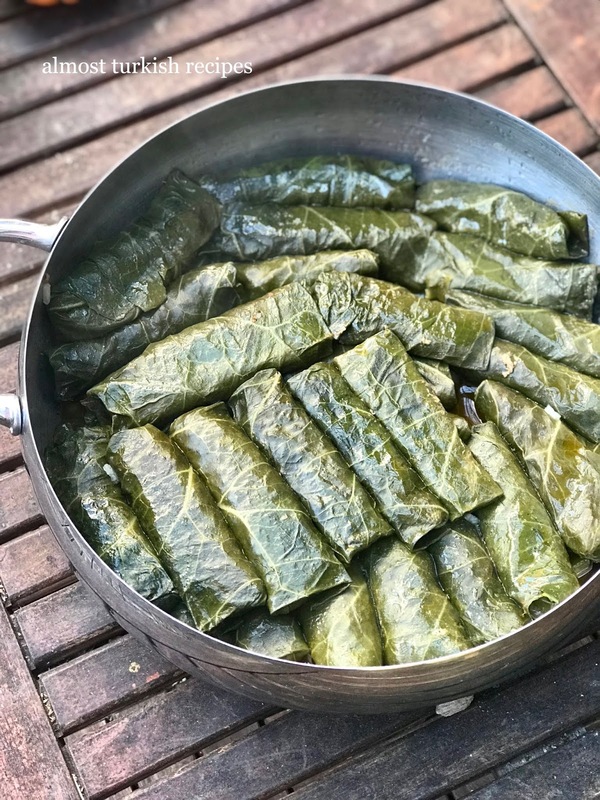 Although kara lahana [literally black cabbage in Turkish] collard greens are a staple in the American South, they are grown and enjoyed exclusively in the Northern part of Turkey, i.e., the Black Sea Region. Rolled collard green leaves is one of the most iconic dishes of the Black Sea cuisine competing with collard greens soup (recipe here). 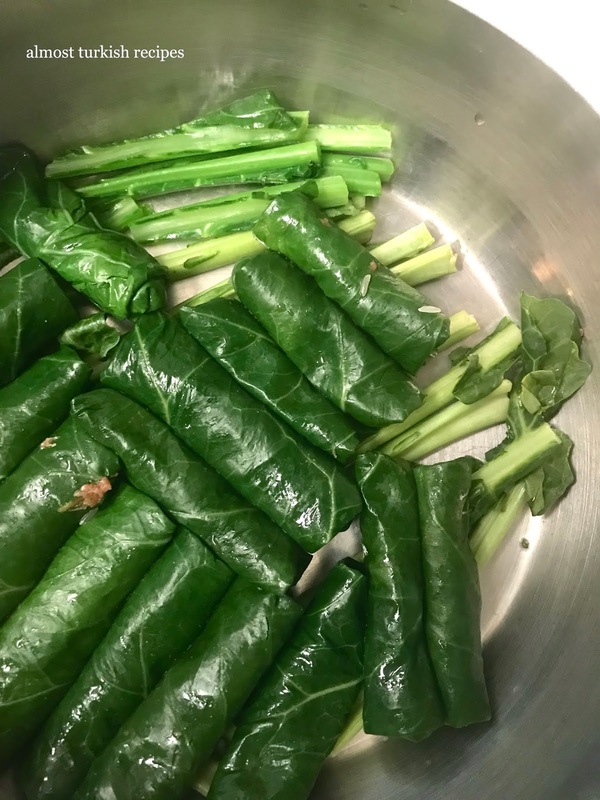 We’re getting collard greens in our CSA farm box almost every week and I am turning them into soups or rolls. 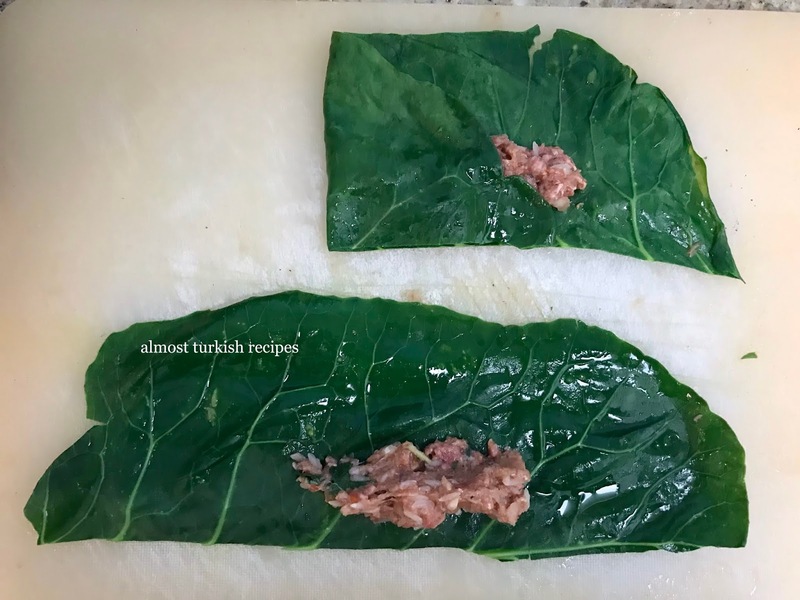 Here’s a classic meaty rolled collard greens recipe. -Wash the collard green leaves. Cut the stems off and set aside; do not discard them. -Bring water in a big pot to boil. 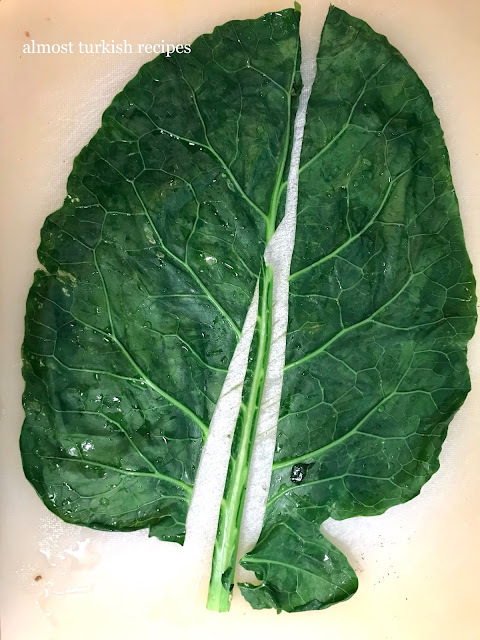 Boil the collard green leaves 4-5 leaves at a time for 4 minutes. Leave in a colander until all leaves are boiled. 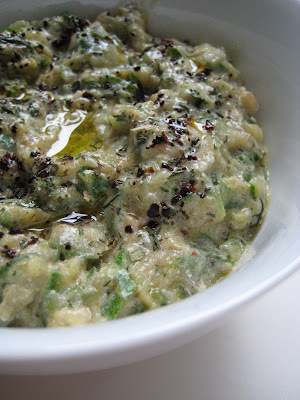 -While the collard green leaves are cooling off, mix well all the other ingredients in a bowl. -Now the rolling part: put a leaf on a flat surface such as a cutting board, your counter, or a tray. Cut the leaf lengthwise into two and take out the middle stem. 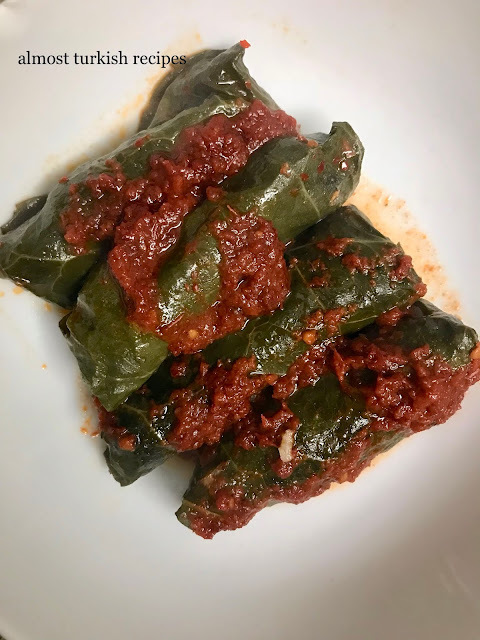 -There are many ways of rolling these leaves such as rolling lengthwise, making triangle bundles, or using the whole leaf if small; however, I find rolling them by placing the stuffing on the long side more practical and easier. - Place ~2 tbsp stuffing on the leaf. Do not over stuff them or they will come undone while cooking. Fold the sides and roll. Repeat until you stuffed all the leaves. -First bring to a boil and cook on low for 25-30 minutes. -For the sauce: Heat the oil(s) in a pan. Once hot add paste and grated tomato. Cook for 3 minutes. -Pour over the cooked rolls. The rolls go well with bread and yogurt on the side.